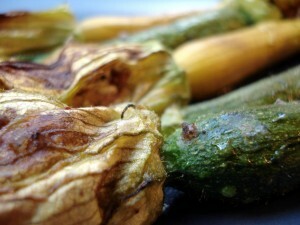 What did I do with the bouquet of yellow squash blossoms I bought from Joel Thiebault’s vegetable stand last week? What about the squash? 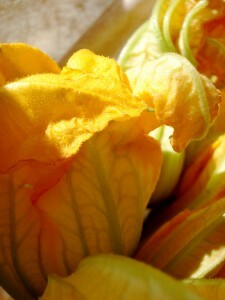 These particular squash blossoms were unique because they were attached not to stems, but to tiny, baby yellow and green squash. I left these on, of course, and together the blossoms, squash and cheese melted in my mouth. What kind of chèvre should you use? When using goat cheese for cooking, I like it to be fresh (chèvre frais in French). I first tried using a more mature cheese and found it didn’t come out smooth and creamy like I wanted. The right texture is important for this recipe! Nothing else? I did experiment with adding different ingredients to the chèvre (olive oil, balsamic vinegar, shallots, ground pepper…), but found that the best combination was simply a nice, quality goat cheese. Otherwise, you take away from the delicate taste of the blossoms. Other advice? Be careful when preparing the blossoms, as they are very fragile. I baked at 425 degrees F (220 degrees C) for 20-25 minutes. Serve warm and savor the crispy, yet soft sensation in your mouth. This entry was posted in Recipes (All), Recipes (Gluten-free) and tagged cheese, sides, vegetables. Bookmark the permalink.